Your floor says a lot about you. Its often the first thing people notice when they walk into your home. If your floor covering shows wear and tear, it can ruin the décor of a whole room. At Kitchens By Hastings, we know there is a solution to all of the problems that lie under foot. None of these jobs would be complete without the right floor choice to polish it off. That’s why we custom create a room from the ground up, with your needs and preferences in mind. Since your home was meant to be lived in and your floors were meant to be lived on, our custom flooring materials are as beautiful as they are functional. For the traditional hardwood lover, we can offer any species and finish to compliment every interior. Imagine your new kitchen redone with supple, and glossy planks of oak, maple, cherry or pine. We carry prefinished wood that provides the look you want without the mess of sanding and varnishing. These floors compliment our custom hardware and cabinets, so you can pick the ultimate combination for your living space. They are durable, dependable and will look great for years to come. This adds value and character to your home. We also offer laminate flooring; an attractive and sensible choice for high-traffic areas. Synthetic flooring is a good choice if you seek low maintenance and high value in a floor covering. Kitchens By Hastings also offers tile. Updating your bathroom floor will add a clean and vibrant dimension to any shower, tub, toilet and sink. We have a great variety of colors to choose from, so you can complete the look that works best. We know you’ve been meaning to redo that floor since you bought the house in 87’… even then, you thought it looked like grandma’s! Once you freshen up with new brand new tile, you can take a bath in the lap of luxury! 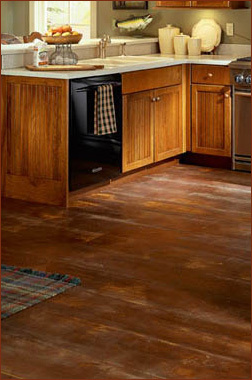 A new custom floor will truly make your kitchen or bathroom shine anew. At Kitchens By Hastings, we offers choice selections for every taste and budget. Come see how our design team can make your remodeling dreams come true!